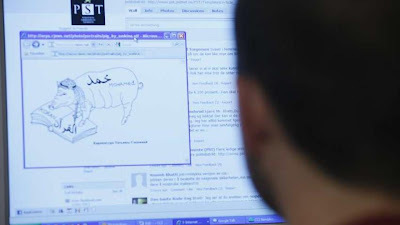 TURKISH HACKERS SUSPECTED IN BRINGING DOWN NORWEGIAN PAPER DAGBLADET FOR PUBLICATION OF PIG MOHAMED CARTOON……. – The Tundra Tabloids……. TURKISH HACKERS SUSPECTED IN BRINGING DOWN NORWEGIAN PAPER DAGBLADET FOR PUBLICATION OF PIG MOHAMED CARTOON……. Dagbladet’s Internet paper was hit by hackers yesterday, crippling the site for about 1½ hours. The denial of service (DDOS) offensive started at about 19:30, when several IP addresses from Turkey started downloading the paper’s front page about 5,000 times each in a short space of time. “I got to know about this just before about 20:30 We used a long time to find out what the cause was, and our suspicions that we’d been subjected to a DDOS from Turkish hackers were confirmed just before 21:00,” Lars Helle, Dagbladet’s acting Editor in Chief tells NRK. Many Norwegian Muslims have reacted to Dagbladet’s decision to reproduce a controversial cartoon of the Prophet Mohammed on the front page of their paper edition last week, portraying the prophet as a pig. Dagbladet has also reprinted Danish Kurt Westergaard’s controversial Prophet Mohammed cartoon depicting the prophet with a bomb in his turban. Westergaard was the target of a recent assassination attempt in his home. Aftenposten reports that there were many theories yesterday evening on Twitter as to why the paper’s site was down, but Helle is discounting any link between the two for now. “I don’t generally subscribe to conspiracy theories, though I understand why you’re asking the question,” he tells his paper. Previous Post Previous Post BUFFOON BRITISH BARONESS BABBLES ON ABOUT BLOOD LIBELS……. Next Post Next Post ITALY: BERLUSCONI AGAIN……!